For even more random silliness… Check out Leah’s blog! Hi Ron! I’m so excited to get the chance to throw a few questions at you! I’ve been following you on Twitter @RonHuxley. Tell us a bit more about yourself. I am a Licensed Child and Family Therapist on the Central Coast of California, living my dream life with my wife of 16 years. We have four children together. Two are my biological children and two are my step children but I consider them all “mine.” By day, I run a children’s mental health clinic for children that have gone through trauma and have attachment related issues. By night, I am run a blog called the ParentingToolbox.com that has been active for 11 years! I often feel that I’m overly aggressive at times in disciplining my children. You often speak about assertiveness at the Parenting Toolbox. What’s the difference between being aggressive and being assertive? Assertiveness means owning and speaking your thoughts and feelings vs saying what others want to hear (or saying nothing at all). Aggressiveness means forcing your thoughts and opinions on others without concern for what they want. On one end of the continuum you have passiveness. On the other, aggressiveness. Assertiveness is somewhere in the middle. It doesn’t mean that people have to do what you want or even care, just because you expressed it. It does mean you respect yourself enough to let your voice be heard. I stumbled across a phrase I’d never heard before while reading at the Parenting Toolbox. The phrase was “I-messages”. Could you explain what an “I-message” is and how to use it? I-messages refer to starting your sentences off with the words “I” vs. “You.” It is a way of taking ownership for what is going to come out of our mouths next. You messages imply blame and create defensiveness in others. How effective is positive discipline versus threatening or spanking? Effectiveness of discipline is evaluated on two levels: short-term and long-term. Threatening and spanking children may get short-term results but they rarely get long-term results. It exerts external control and does not foster thinking skills or concience development. The child simply doesn’t want to be spanked but if mom or dad are not around to give a spanking, will the child make the right choice? I hate time out. It is an overused and tired parenting tool given by educators and social workers to abusive parents who have very little insight into how to parent/discipline. Time out is only good when the parent needs a break and feels out of control. Then it is ok but is a tool for mom and dad, not for the child. I have a reoccurring problem in my home. My children, ages 3 and 4, will often wait to listen until I get angry. Sometimes I feel like they do it to get a reaction out of me. It drives me crazy! How can I solve this? If your children only react when you get angry, this means it has become a “game.” One no one wins obviously. 80% of all children’s misbehavior is for attention. Give them attention for any behavior that is opposite of the behavior you don’t want and see if that increasing compliance. Reward what you want, not what you don’t want. I’ve tried something like this before… but I’m going to try again with your explanation in mind. Thank you so much for taking the time to answer my questions. I hope that some of my readers will benefit from our chat as well! How can people contact you? Parents can contact me at my blog: http://parentingtoolbox.com They can follow me on twitter at http://www.twitter.com/ronhuxley as well. Celebrate the Launch of MomActive! The following is an essay I wrote about Leah Segedie, the mom behind Bookieboo. I nominated her for Extraordinary Mom with MomFavs. Her story was chosen and we appeared on MomFavs Blog talk radio show. I just thought I’d share my essay with all of you since Leah has a new project launching called MomActive. “I met Leah in February of 2009 on www.bookieboo.com, a social network for fitness moms. I had been looking for a supportive group of moms after I closed my boutique. Sports has always been a passion of mine… so I thought I’d give Bookieboo a shot. I definitely found what I was looking for and more. Leah was my first friend. She greets everyone who joins the site… because she is it’s creator. I responded to her welcome message and from there on we became fast friends. Now we collaborate on projects, skype for hours, share vlogs and comment on eachother’s blogs, tweet like there’s no tomorrow and really just have a great time. Being overweight before she became pregnant, Leah lost over 100 pounds after the birth of her first child. She was 253 pounds and using a walking aid to get around. She joined up with Tae Bo and Weight Watchers and worked harder than we can ever imagine. She got down to an athletic 149 pounds. It’s so inspiring for the members of her site, www.bookieboo.com. She shared the journey of how she did it with her membership. Leah just recently had a second child and her journey begins again. It’s not as drastic as the first time, but just as motivating. She began a group on www.bookieboo.com called “Losing Weight with Leah”. In it, she shares her ups and downs as she tries to get back into shape. Leah is candid and doesn’t hold back from her readers. She’s encourages them too in comments back. Leah is always looking for guest writers for her site that have relevant information to help her readers. She works hard to find live guests for her Twitter parties too. These Twitter parties allow moms to interactive with the guests and have been wildly popular. The second week in June, Leah will launch her first radio show, MomActive. It focuses on maintaining a healthy lifestyle and balancing your life. Even with all of this going on, Leah even lets moms use Bookieboo as a place to grow their own businesses. She offers paid and free advertising on her site. She even allows members to start groups. I started a group for Networking Moms to help share ideas. It’s been fantastic. Since then, we’ve been collaborating on a number of projects that have not only helped to boost my career, but also my confidence. Leah has a way of doing that. Even though Leah is extremely busy, she still somehow finds time to take care of her home and her family. Once, she said her house was messy and she showed me the room on her webcam. There were a few toys scattered, but not messy by any means… I showed her mine and she was like… That’s messy! Ha! Leah has a wonderfully supportive husband and two adorable boys. She often vlogs about their adventures and shares them openly with her audience. For all the details on the MomActive Launch Party… Click the banner below! Meet Ada Vaughan, mother, graphic designer, and self-proclaimed geek. Ada is the creative mind behind Cutey Baby. In early 2009, Ada launched Cutey Baby as a way to give parents an affordable and non-permanent way to personalize their child’s bedroom walls. 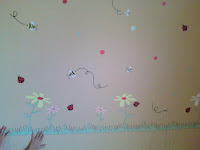 Ada so generously gave me some of her amazing artwork to try in my girl’s room. Even better than that… we got to test a new design she’s been working on called “The Bees Knees”. I had recently made my girls new duvet covers in bumble bees and dots… so I knew this was going to be great! Our package arrived Fed Ex, safely packaged in a poster tube. I was as eager to unroll the sheets and get started! The decals were easy to peel and even easier to apply! Just peel and stick! I also found Ada to be helpful in deciding on a layout. Cutey Baby is allowing us to share the love by doing a special giveaway! One lucky reader will receive (1) sheet of wall decals in the design of their choice! Contest Ends 12 midnight PST, June 30th, 2009. Winner will be notified by email on July 1st. 1. Visit Cutey Baby and report back to me your favorite design. Thanks so much for your support of Cutey Baby and Childhood Clothing!